Nokia is now doing experiments thru making Phone Edition pattern to known showbiz personality. And the latest on in their list is the N96 Bruce Lee Edition which was shown in China. The limited Bruce Lee Edition of N96 comes with a back cover with Bruce Lee’s face and signature, and a Bruce Lee themed phone strap. The N96 is the same as the original one featuring a 2.8-inch screen, a 5 Megapixel camera with Carl Zeiss Tessar lens, Bluetooth, WiFi 702.11b/g, A-GPS support and FM tuner. 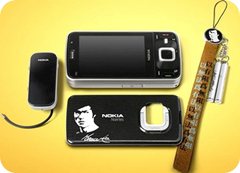 It is reported that The Bruce Lee Nokia N96 costs 8,788 Chinese yuan (about $1,286). So whom do you think will be the next superstar in Nokia’s Star Edition. Will there be Filipino’s in the list ? What Do you think. waw! kras na kras ko yang si bruce lee! kahit di ko sya naabutan! minsan lang ako magkagusto ng fone! and I WANT THAT BEAUTIFUL DAMN THING! bka nman po c President GMA o Jok2 Volante ang susunod na image, yay!!!! Manny Pacquiao? I don’t think so. In a few years, aalis na siya sa boxing arena..
Hmm.. I don’t look like a legend though. Hehehe. OO nga naman . Layo pa po..
SELaplanas last blog post..How to pick the right Webhost for your Blog?